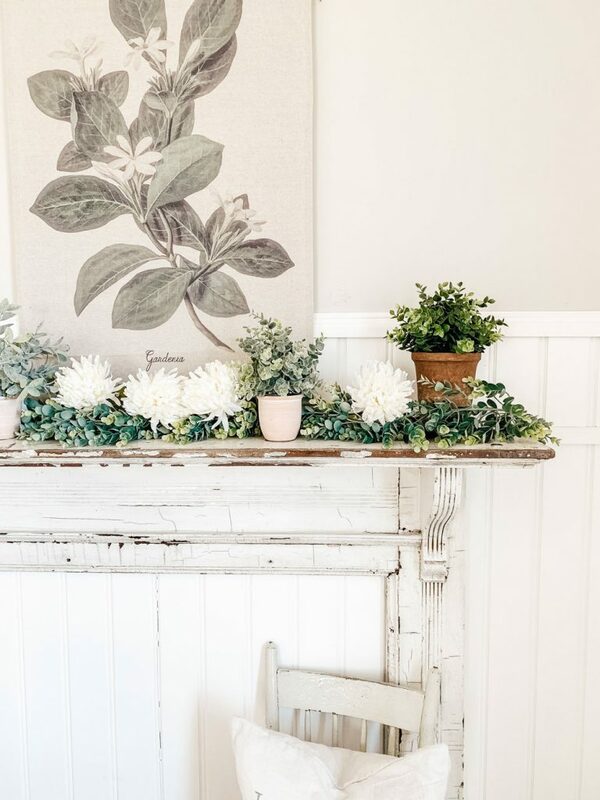 Today I am sharing my simple approach to decorating my mantel and dining room for spring. This year I have been craving less cluttered spaces. There is something about a clean organized space that gives me a clear mind. Anyone else feel this way? With that being said I decided to take a simple approach to my spring decor this year. Last week I shared my living room and den, as well as tips on how to bring spring into your home. If you missed it you can read it here. Today I would like to share one of my absolute favorite areas in my home to style. If you hadn’t guessed already it’s my mantel! 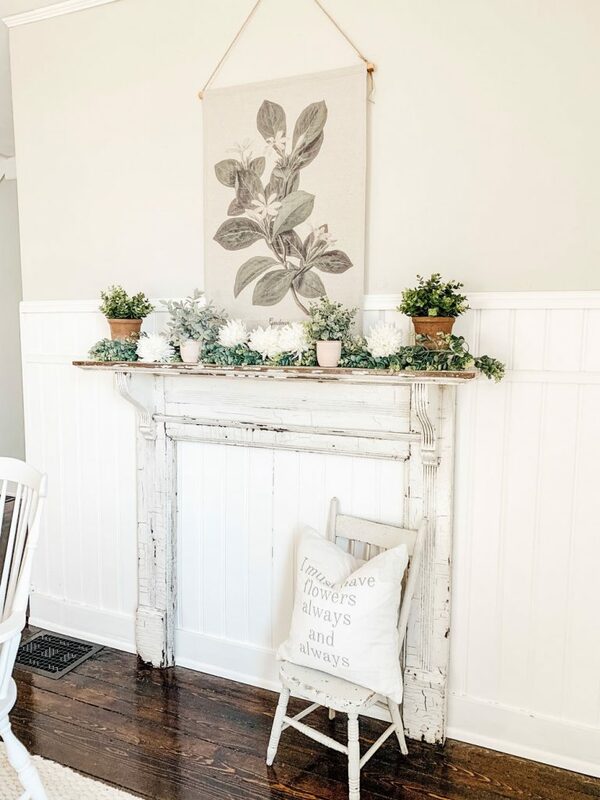 This mantel is my favorite vintage find ever and it gives me so much joy to change it out for the seasons. 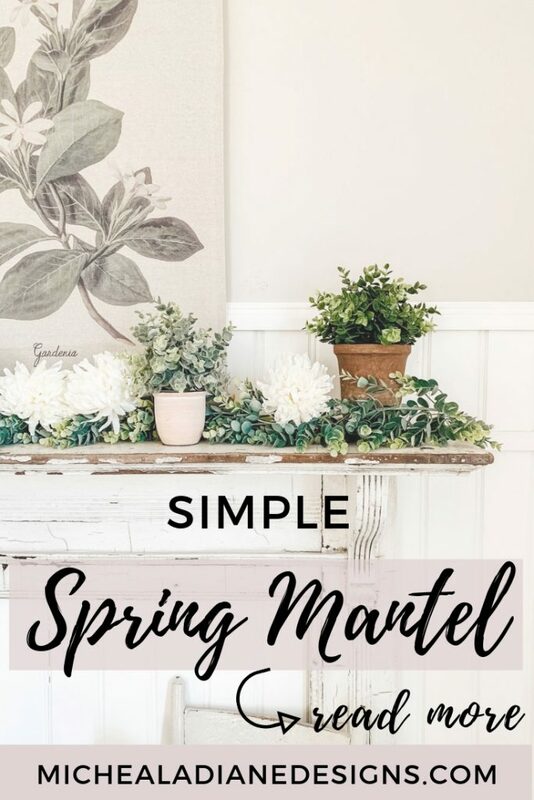 Today’s post is all about how I added some beautiful and simple spring decorations to my mantel and dining room. Grab some snacks and let’s get started. I found this beautiful Gardenia linen tapestry a few months back and I knew it would be perfect for my spring mantel. One of the challenges with decorating a mantel is filling the open space above it. If you use something too small it will get lost and not look balanced. The fact that we have high ceiling also makes it a little more difficult. This linen tapestry was a great fit for the space and perfect for spring. One of the must-have items for a spring mantel is flowers and greenery. 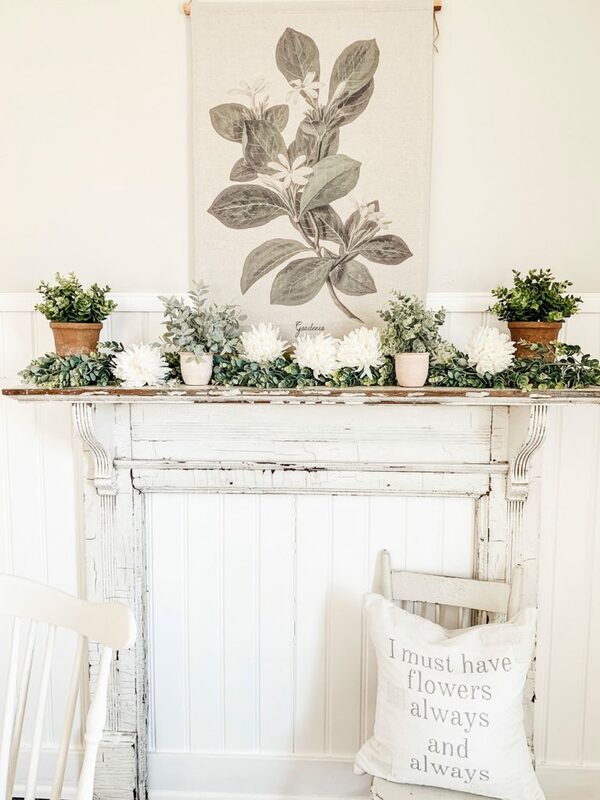 Decorating a mantel is all about layers and for this spring mantel, I decided to layer in different types of greens and flowers. I would usually add a few other elements to have a balance of different decor items. But with the theme of simplicity, I strategically only used plants. And I am loving how it came out, it is giving me all the garden vibes. To style the mantel I started with a eucalyptus garland. Eucalyptus is one of those greens I believe can be used for any season. Then I layered these faux plants in whitewashed terracotta pots that I found at TJMaxx. These are perfect for easy styling because the plant and pots are all in one. 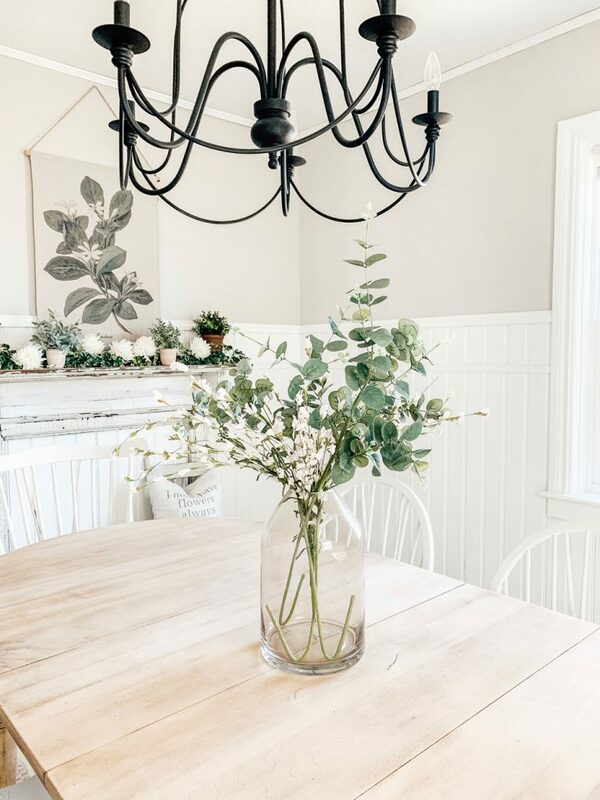 This is one of my favorite ways to buy faux plants. On the ends, I used a set of terracotta pot that I already had and placed those faux greens from IKEA in them. Lastly, I added these white flowers to pull the whole look together. 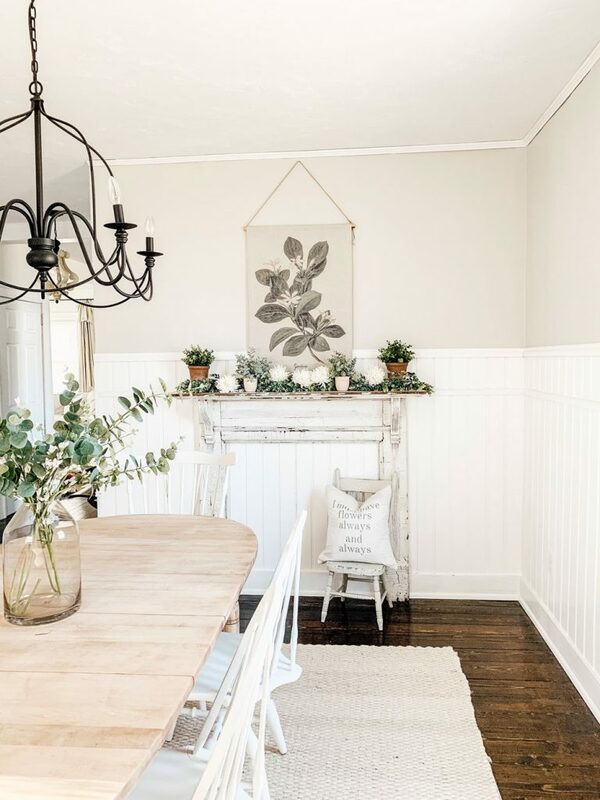 This spring mantel was easy to style and used simple design elements that are perfect for spring. 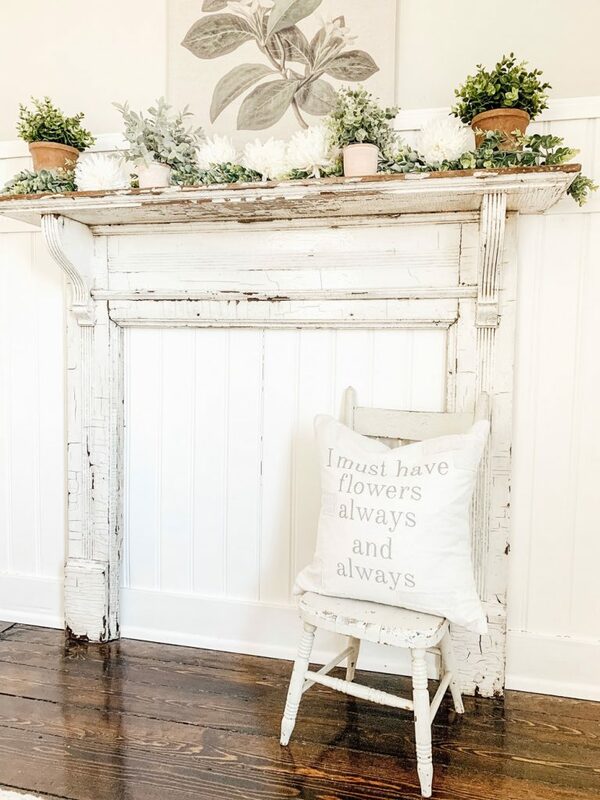 “I must have flowers always and always” When I saw this pillow from With Lavender and Grace I knew I had to have it for spring. I have shared Bianca’s pillows a few times before and I just love them so much. They are neutral and have these adorable patches on them, making them perfect for a farmhouse style look. 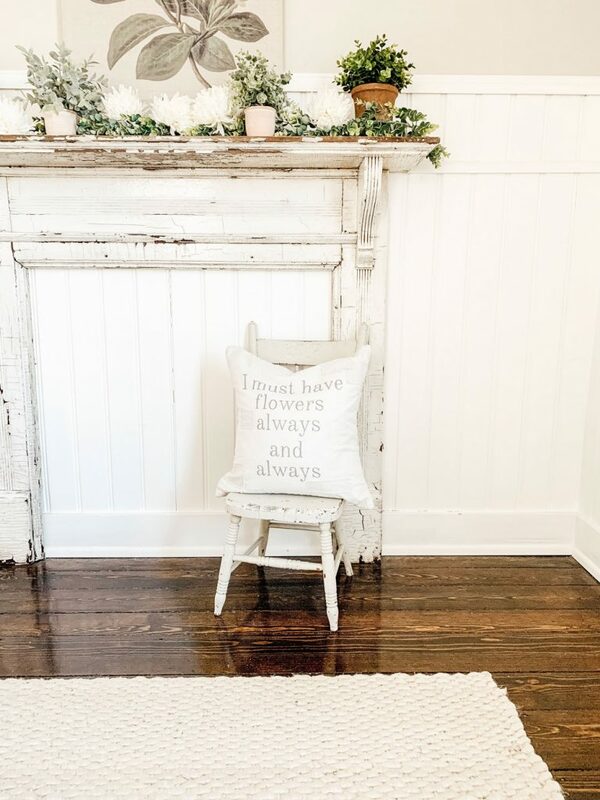 I styled it on this antique kids chair and I love how it pairs with the spring mantel. For the rest of the dining room, I kept it super simple. For example, I used this beautiful glass vase with a mix of eucalyptus stems and spring flowers. Ever since we refinished this table I enjoying keeping my dining table super simple. Soon I will be sharing how we transformed this table, so be on the lookout for that post. I get so many questions about the rug we use in our dining room. 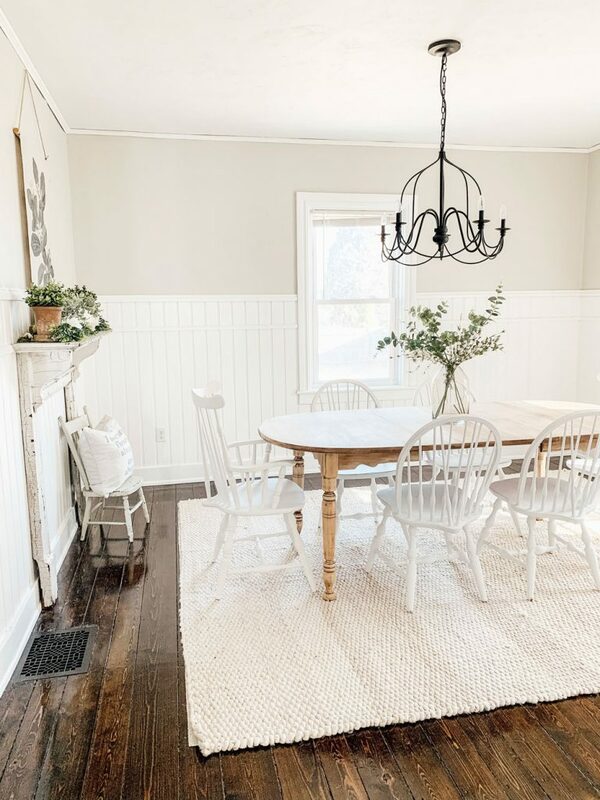 It is a handspun bleached white jute rug. 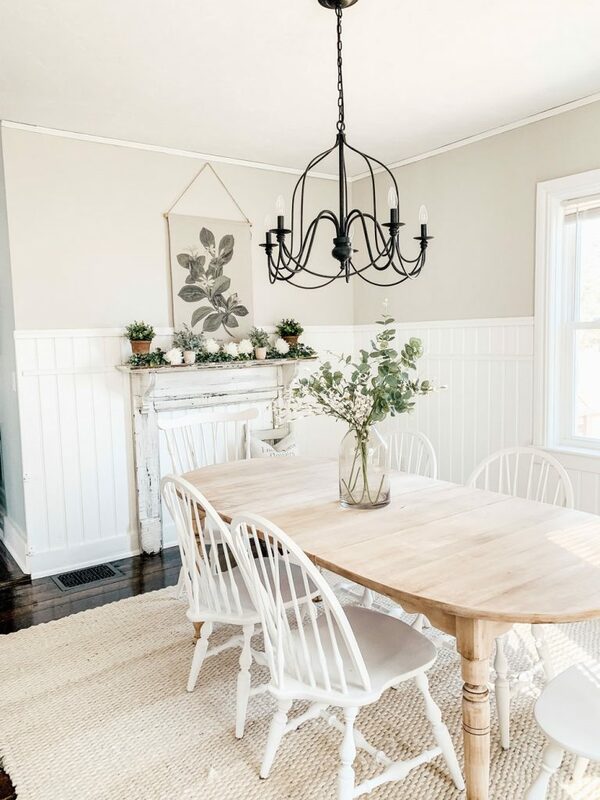 The creamy white is the perfect contrast against the dark hardwood floors. It has been easy to keep clean and I love the texture that it adds. Here is the link. 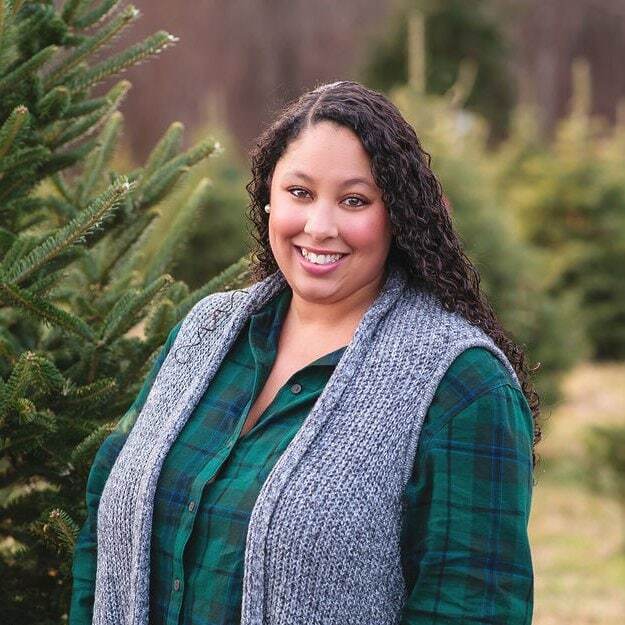 I am so happy you stopped by the blog today. This creative space has brought me so much joy the past few months and I am so thankful that you are here. 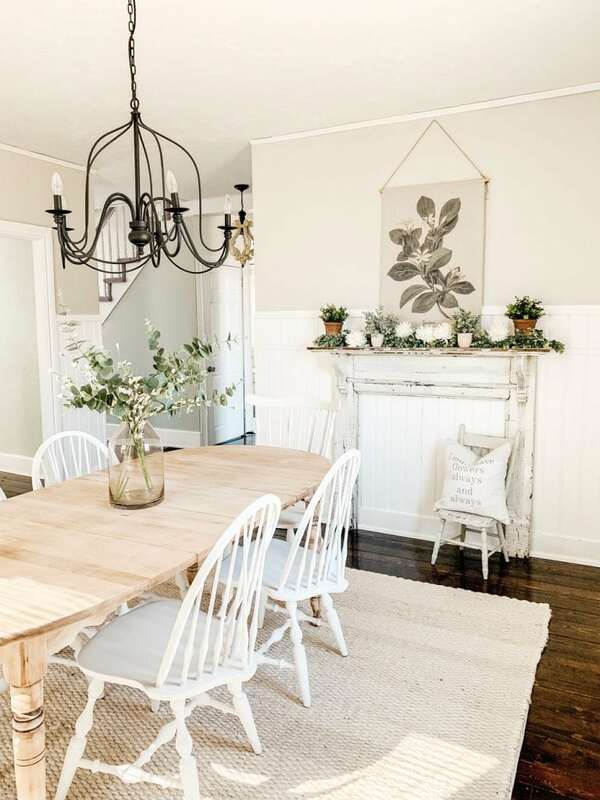 Hopefully, you were inspired to take a simple approach to your home decor this year and got some ideas for your own spring decor. Want to save this for later? 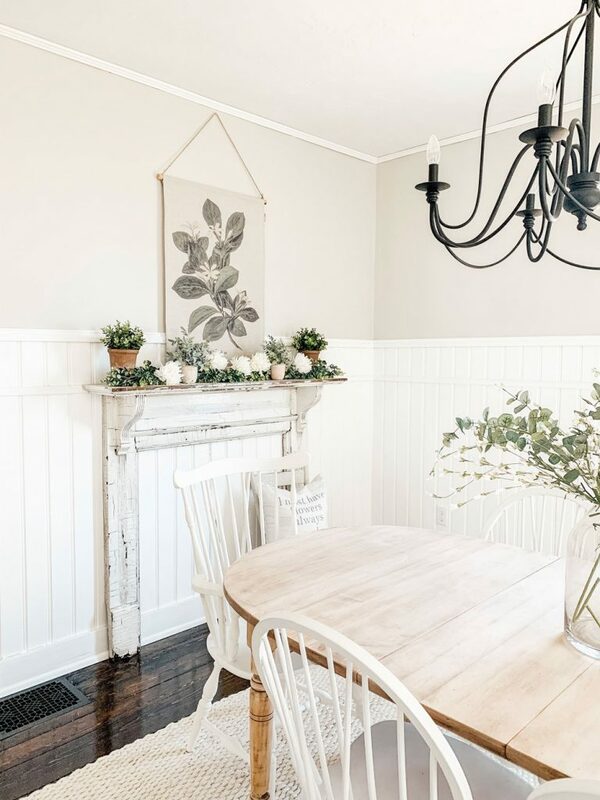 Post this Simple Spring Mantel and Dining Room to your favorite Pinterest Board!